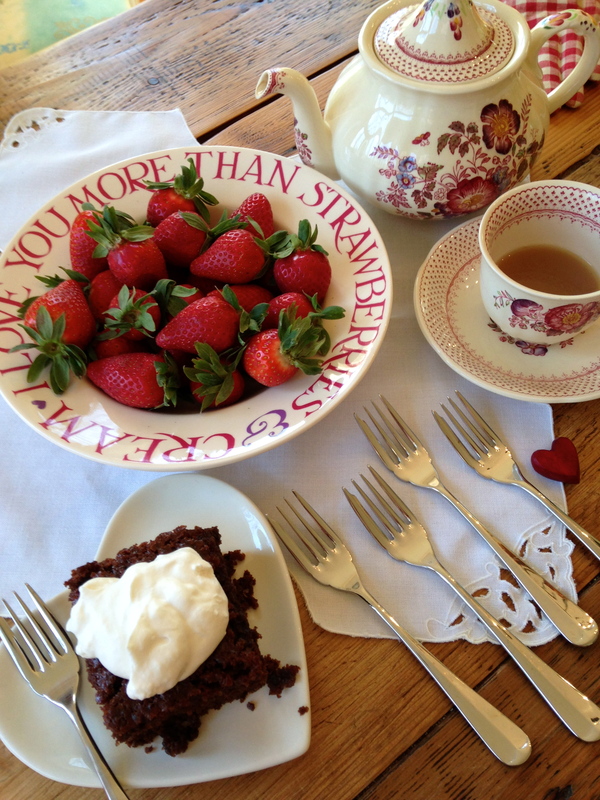 I grew up noticing the food feasts, picnics, church revival din­ners with long white tablecloths. Families put out warm fried chicken, braised leg of mutton, thin slices of boiled Virginia ham. Green beans cooked in pork stock, beets in a vinaigrette sauce. English peas in cream. Baked tomatoes with crusty squares of bread on top. Fragrant corn pudding. Potato salad with a boiled dressing. Watermelon and cantaloupe pickles and relishes, preserves and jellies, and iced tea. 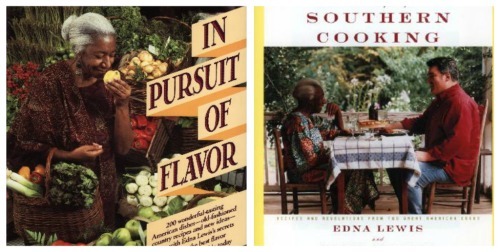 Edna learned to cook by watching her mother and Aunt Jenny, inheriting the values that would inform the rest of her life — a love of nature, a strong sense of family and community, the deep pleasure of living in harmony with the seasons, pride in family and cultural heritage, the satisfaction of honest hard work and savoring its delicious rewards. Edna serving dinner guests at Café Nicholson (l to r): ballerina Tanaquil Le Clercq, the novelist Donald Windham, Buffie Johnson, Tennessee Williams and Gore Vidal (1949), photo by Karl Bissinger. At age 16, after her father died, Edna left Freetown and eventually ended up in New York City, where after working at a few odd jobs, she partnered with antiques dealer John Nicholson, who opened Café Nicholson in the late 40’s. There, Edna was in her full glory as THE cook, quickly gaining a loyal following amongst artsy/bohemian types (Greta Garbo, Gloria Vanderbilt, Marlon Brando, Howard Hughes, Marlene Dietrich) who couldn’t get enough of her cheese soufflés, roast chicken, filet mignon and soon-to-be world famous chocolate soufflé. Ex-pat Southerners like William Faulkner and Truman Capote got the taste of home they so craved; Edna tells of how Truman (whom she called “cute”), often asked for biscuits, and Tennessee Williams, a regular who lived close by, walked her home. 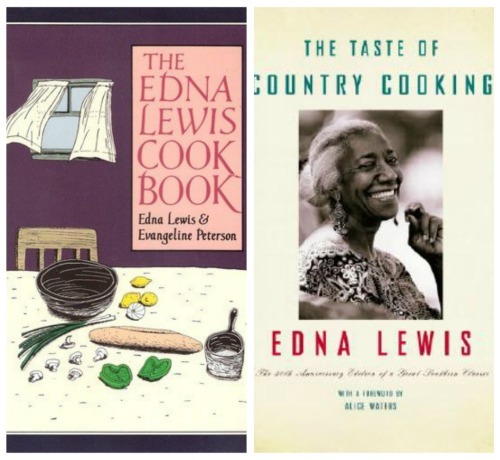 In all, Miss Lewis published four cookbooks, the last co-authored with her dear friend and cooking companion Scott Peacock, who cared for her during the last six years of her life. She received many awards and honors for her work, including an IACP Lifetime Achievement Award and the James Beard Living Legend Award. She re-defined Southern cuisine and its finer nuances, forever banishing the longheld stereotype that it mainly consists of greasy fried chicken and watery greens. Southern is a seafood gumbo of crab, okra, tomatoes, scallions, onions, green pepper, bacon, garlic, and herbs. Southern is fresh-made corn fritters, light and crisp enough to fly away. Southern is an okra pancake in a cornmeal batter. Southern is a platter of deviled crabs prepared with soaked slices of white bread torn and mixed with chopped onion, fine-cut scallions, melted butter, fresh-ground black pepper, cayenne, eggs, and the best crabmeat. Baked in the oven, served hot, a morsel to die over. Southern is a pitcher of lemonade, filled with slices of lemon and a big piece of ice from the icehouse, and served with buttermilk cookies. Southern is a delicious chicken salad at a bride’s luncheon. She is remembered as a strikingly elegant, stylish woman with dangling earrings who designed and made all her own clothes from West African batik fabrics, a soft-spoken woman of quiet dignity who made you want to savor her every word. She became a famous chef at a time when female chefs, let alone African American ones, were few and far between. She was the first person in her family to vote, took great pride in working for FDR’s first presidential race, and marched with Martin Luther King, Jr. in the Poor People’s March in Washington (1968). She liked Bessie Smith, Jack Daniel’s, and could tell when a cake was done just by listening to it. The early cooking of southern food was primarily done by blacks, men and women. In the home, in hotels, in boardinghouses, on boats, on trains, and at the White House. Cooking is hard and demanding. It was then, and it still is now. What began as hard work became creative work. There is something about the South that stimulates creativity in people, be they black or white writers, artists, cooks, builders, or primitives that pass away without knowing they were talented. It is also interesting to note that the South developed the only cuisine in this country. Living in a rural setting is inspiring: Birds, the quiet, flowers, trees, gardens, fields, music, love, sunshine, rain, and the smells of the earth all play a part in the world of creativity. It has nothing to do with reading or writing. Many of those cooks could not read or write. Now, would you like another piece of her Warm Gingerbread with Sweetened Whipped Cream? In The Taste of Country Cooking, many of the recipes call for the now obsolete Royal Baking Powder, with Miss Lewis’s suggestion that you make your own baking powder from “two parts cream of tartar to one part baking soda,” since the chemicals in today’s widely available double acting baking powder (aluminum-sulfate-based) leaves a metallic “tingle” on the tongue. So I made my own baking powder and replaced the 1/4 cup of lard with butter; I see from the revised recipe that I could have simply used 1/2 cup (1 stick) of butter instead. As it turns out, the extra butter didn’t hurt one bit! This was easily the best gingerbread I’ve ever tasted. 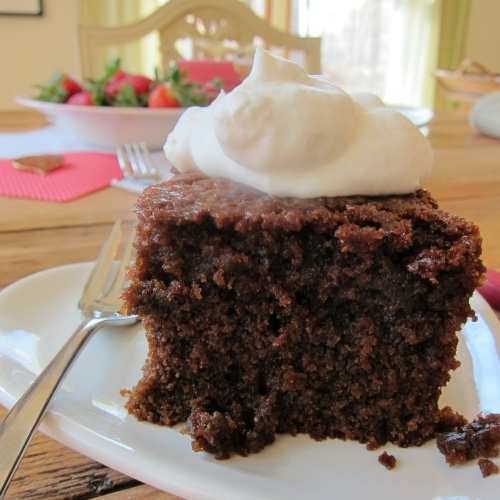 There is no refined sugar in the gingerbread itself, only molasses, and with a full tablespoon of ground ginger along with the cinnamon and cloves, you can just imagine how good the kitchen smelled when this beauty was baking! In her headnote, Miss Lewis says, “I remember Mama dipping a teacup into the stone crock of molasses and spooning out the sugary syrup into the pungent ginger batter. Warm gingerbread with fresh, skimmed, heavy cream was an exotic treat after a meal of fresh pork or game on a chilly fall evening.” Hello! 2. Butter and flour an 8 x 8 x 2-inch baking pan. 3. In a large mixing bowl, sift flour, soda, baking powder, cloves, ginger, cinnamon, and salt. 4. Melt the butter (and lard, if used) in the boiling water, then whisk into the floured mixture. Stir well, then add beaten eggs. 5. Continue stirring, add molasses, and stir well again. 6. Spoon the batter into the baking pan and bake for 35 to 40 minutes, or until a skewer inserted in the center comes out clean. 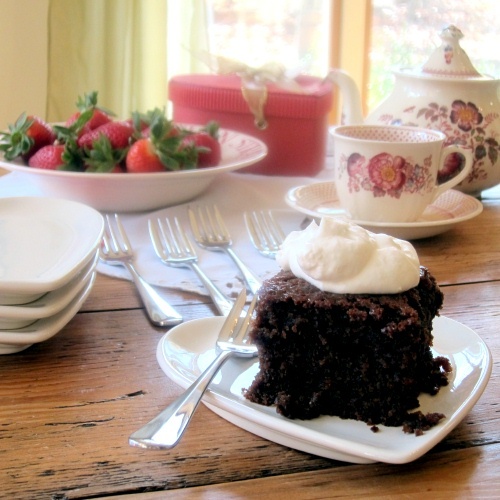 Whip the chilled cream until it forms soft peaks but is not too stiff, then add sugar and vanilla. Serve with warm gingerbread. Note: I used 3/4 cup butter and 2 cups unbleached flour. You can also use 1/2 cup butter with 2 cups bleached all-purpose flour, or, 1/2 cup butter with 1-2/3 cup unbleached flour. Sift the ingredients together 3 times, transfer to a clean, tight-sealing jar, and store at room temperature, away from sunlight, for up to 6 weeks. 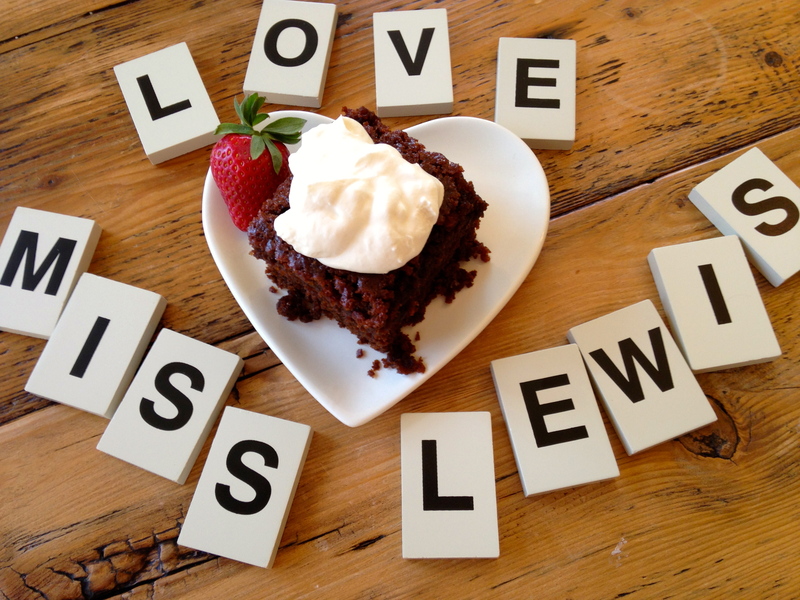 ♥ Enjoy this wonderful award-winning documentary about Miss Lewis, “Fried Chicken and Sweet Potato Pie,” written, produced and directed by Bailey Barash. You’ll get to hear her voice and feel her essence — it’s spiritual, calming and comforting. As so many others have said, she has a great face — a presence — and was truly a luminous individual. You’ll also get to hear from Scott Peacock about their unusual, abiding friendship. Well worth 20 minutes of your time. ♥ I also highly recommend her essay, “What is Southern?”, which I freely quoted from in this post. A beautiful piece of writing! ♥ Check out her cookbooks. 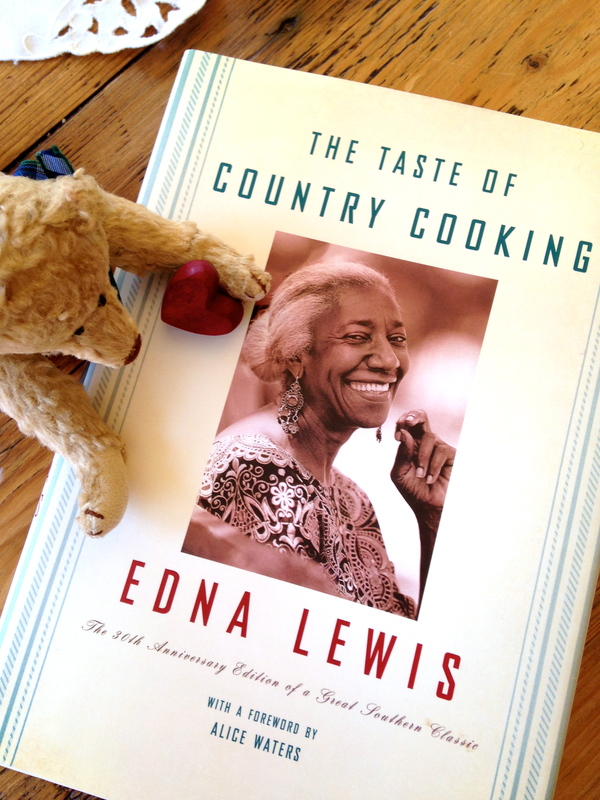 Her first, The Edna Lewis Cookbook, is available on the secondary market and is now a collector’s item. 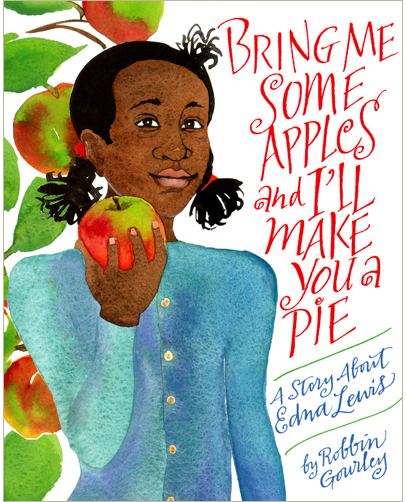 ♥ Yes, there is a children’s picture book about Miss Lewis written and illustrated by Robbin Gourley, Bring Me Some Apples and I’ll Make You a Pie (Clarion, 2009), which I reviewed here. When the weather gets warmer, I hope to visit Lahore and Unionville to see where Miss Lewis grew up and was finally laid to rest. This post is being linked to Beth Fish Read’s Weekend Cooking, where all are invited to share their food related posts. Put on your best bib and apron, and come join the fun! < Previous here comes the soup! here comes the soup! This is my all-time favorite cookbook–I have the 1976 edition. I bought it for the stories (the recipes are too hard for me) and the sense of community and family that comes through her writing so clearly and honestly. I have lots of cookbooks I buy for the pictures and stories, but this one is the one I pull out and take to bed to read. I would have loved to have dinner-on-the-ground with Miss Lewis and her family. I live close to Orange and have been to Unionville often. Freetown is hard to find–it’s not even on my very detailed old Virginia topo map. Maybe I’ll try again soon. Thanks for the head’s up on her essay–I’m on it! I love the Robbin Gourley book so much! And I love love love warm gingerbread. But can I bring myself to use lard? Even though I know butter is kind of lard in its own way? Gaaaah! I don’t think I can do it! You don’t have to use lard — I didn’t want to use it. You can use one stick of butter with two cups bleached all-purpose flour. 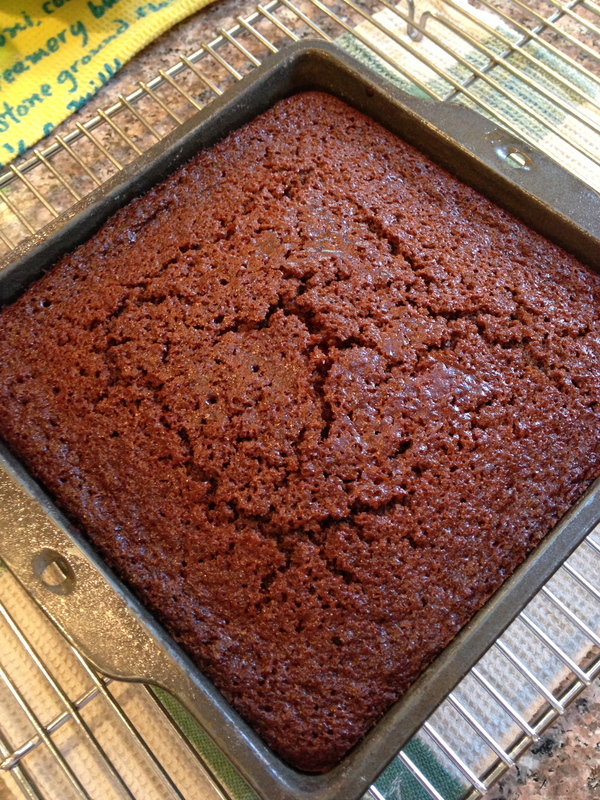 Luisa (The Wednesday Chef) used cake flour with butter. Sorry for the confusion. I didn’t realize I could have just used one stick of butter (as per E&S’s revised recipe), so I used one stick + another half stick ( as a substitute for the lard). This worked for me with my unbleached flour as far as moistness is concerned. The revised recipe calls for only one stick of butter when using bleached flour — but advises to decrease the flour by 1/3 cup if you’re using unbleached flour or else the gingerbread will turn out drier. I hope I’m not confusing you any further . . .
She’s just so easy to love, isn’t she? Robbin’s book is just lovely — beautiful watercolors and she interweaves folk rhymes with her narrative. There are about four or five Southern-style recipes in the back from her Sugar Pie and Jelly Roll Cookbook too. I was just reminiscing with an older relative about my grandmother (the biscuit one, remember?) & wishing I could go back to taste all her cooking, but especially the fried chicken & the beets. She raised her own chickens & we thought the chicken heavenly, & I suppose it was. The beets were grown & picked early & served in a vinaigrette sauce. How did they do it all I wonder? I didn’t know much about Edna until your post, Jama. What a story! I’m going to have to own one of these cookbooks. They sound wonderful. Thank you. It *is* amazing how much our grandparents’ generation were able to do — so many things from scratch without fancy equipment, and they were self-sufficient in ways we’d never dream of being today. My grandmother also had a sizable vegetable garden and big yard; I think I took it for granted back then. It’s really wonderful that you still make your grandmother’s biscuits. Fresh beets are really a treat. Edna talks about picking vegetables fresh the garden first thing each day. We miss being able to grow any fresh veggies or even have flowers at our present house because of the deer and inadequate sunlight. Farm markets are the next best thing. I do hope you get one of Edna’s cookbooks. The Taste of Country Cooking is a classic, and you’ll like it if you’re interested in her stories as well as recipes. The last book she co-authored with Scott is more of a standard cookbook. I haven’t seen the other two yet, only know that the first has recipes she made at Cafe Nicholson. Lovely post! PS You are the Queen of Tablescapes! Thanks so much, Sandy. Glad you enjoyed reading about Edna :). Every time you have a post, I leave with such a good feeling. There is so much joy, learning and food here, it’s enough to make someone want to fly. Edna Lewis was such a gifted chef and we are the better for her books. I do need to get the Bring Me Some Apples title. That went under my radar but again, you lead me to it. Thanks for another wonderful, delicious look at a person and her books worth knowing. Thanks for the lovely and generous comment, Margie! I’m so lucky to have blog readers like you who are so attentive and encouraging and share my enthusiasm for books, food and special people. Miss Lewis is such an inspiration — I can’t imagine her courage going all the way to NYC at such a young age. She joined the Communist party and married a Communist and was apparently quite the political activist in her own quiet way through her food work. Much later, after her husband died, she met Scott and they were known as the “Odd Couple” of Cuisine; they became family; I love that food brought them together and enabled them to connect on such a deep level. I loved that about her too! She learned that trick from her mother :). I do hope you make the gingerbread sometime — a good reason to indulge in some whipped cream too :). Oh, JAMA. I am so ashamed of never having heard of this woman, and here I call myself having written a novel about a girl who wanted to be a chef!!!! History always has so much better characters to write about than our imaginations; truth, being more awesome, than fiction, almost every time. Jama, you are absolutely right: She’s the one! My mother always made her own baking powder the way Miss Lewis said to do. What a lovely tribute you’d done. Smart mother! Thanks for reading :). Wow! She sounds like a good cook! I want to make more of her recipes!! A beautiful post full of comforting goodness. I do hope someone checked Cornelius’ ID before he got a hold of that J.D. 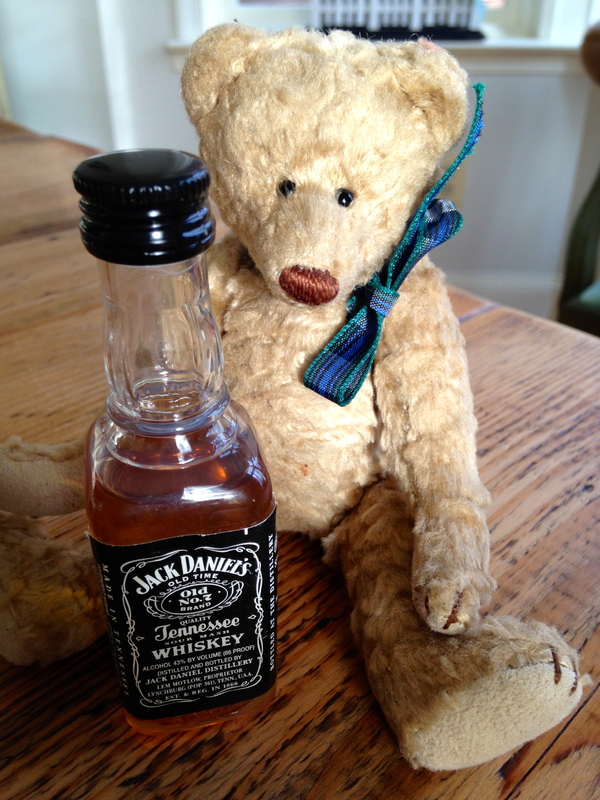 He looks far too young to be of legal drinking age. LOL. Cornelius is older than you think. I got him in 1983!! I’m the one who needs an ID 🙂 . . . 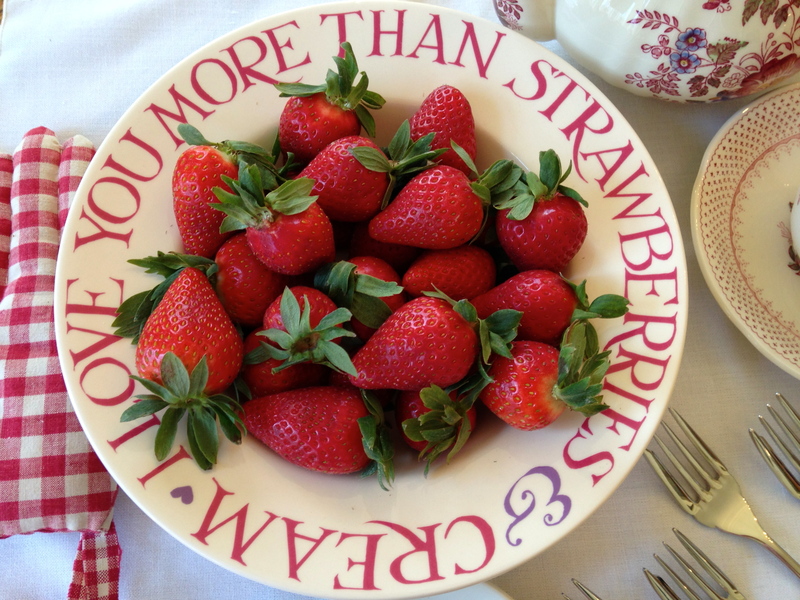 The strawberry bowl is Emma Bridgewater — can’t get enough of her stuff! And that gingerbread looks wonderful. Do look her up — she’s quite inspiring all around. I feel foolish, I have not heard of Edna Lewis. Thanks for enlightening me and sharing her marvelous story. No need to feel foolish — you know about her now, and that’s what counts!! Fantastic post. I hadn’t heard of Edna Lewis either – I’m going to follow up and find out more. Yay! Glad you’re interested in learning more. Of course the best way is to start making her recipes :). 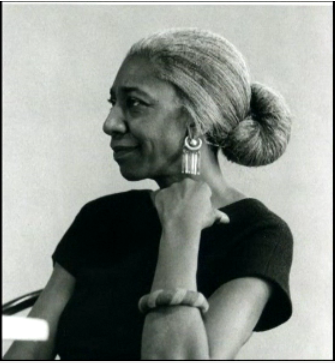 I had never heard of Edna Lewis until now! Thank you for such a wonderful post and I think this gingerbread will become a favorite! Wow your pictures are amazing! This sounds like an incredible cookbook, and an incredible lady! She’s definitely one-of-a-kind, and her story is inspiring and so interesting. I love reading about all her family traditions. Emma Lewis has a wonderful serene look on her face. You just know her food tastes good. I love that 1949 photo — Donald Windham reminds me of Han Solo, Tennessee Williams reminds me of Langston Hughes, and Gore Vidal makes me think of Jay Gatsby! I have an overactive imagination. There’s definitely something timeless, classic and serene about Edna’s face. It’s like the face of the ages or something. Tennessee reminds you of Hughes? Interesting. Will have to study the photo again.